Citrus fruits, those tropical jewels cultivated in Asia for at least 4,000 years, are now available year-round in almost any supermarket in the world. If you're trying to lose weight, you might consider picking up some oranges, lemons or limes the next time you go shopping. Though not all claims made about them are true, citrus fruits, used appropriately, can help you lose weight. A common misconception is that some citrus fruits, especially lemon and grapefruit, can boost your metabolism and therefore increase your weight loss. The American Council on Exercise disagrees. In its article "Diet Myths Debunked," it states that no foods increase metabolism, and that the only way to increase metabolism is to build lean muscle mass. Even though citrus fruits can't raise your metabolism, they can help you control hunger, if you eat the whole fruits. Citrus fruits are rich in fiber and water. For example, an orange provides 3.1 g of dietary fiber, according to "Fat Secret." High fiber, high water foods fill your stomach and take time to digest, which helps you maintain a sense of fullness, reports the Mayo Clinic. Citrus fruits can also help your lose weight by providing flavor without calories. Lemon juice is a classic flavoring for poached fish, but you can also use it on chicken or vegetables. Nutritionist Ellie Krieger recommends using frozen orange juice to make a glaze for pork chops and using limes to make fruity Granitas. See the Resources section for the recipes. When buying citrus fruits, look for bright, even color. Citrus fruits should not have noticeable blemishes, and fruits should feel heavier than they look like they should be. If you intend to juice your citrus, "Cooks Illustrated" magazine recommends looking for citrus fruits that give a little when pressed. These fruits, especially lemons, have thin skin and more juice. If you take prescription medications, check with your doctor before you eat grapefruit, pomelos, and orange marmalade. 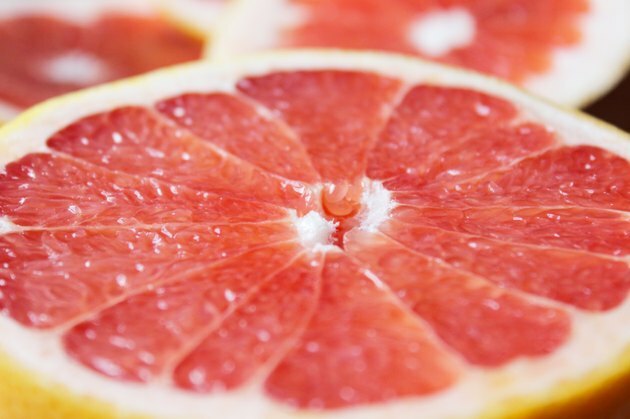 Grapefruit, as well as pomelos and the Seville oranges used in marmalade, deactivate some of the enzymes your body uses to process medications, according to the Mayo Clinic. The clinic reports this can cause the drugs to build up to potentially dangerous levels and cause side effects. Does Eating Lemons Burn Fat?